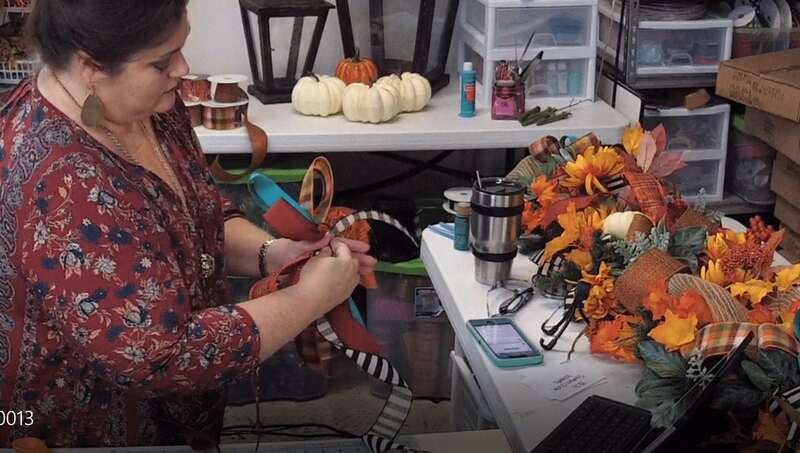 Today in the wreath shop we’re using a store bought fall door hanger pumpkin to inspire us! 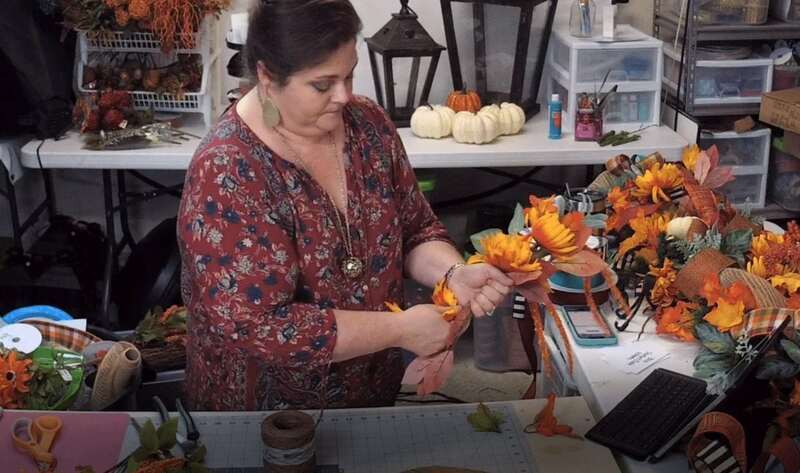 Using just ribbon and silk flowers we’ll take the pumpkin from average to amazing. This post contains affiliate links for your convenience. If you click a link and make a purchase, I could earn a few pennies in commission. Click here to read my full disclosure policy. 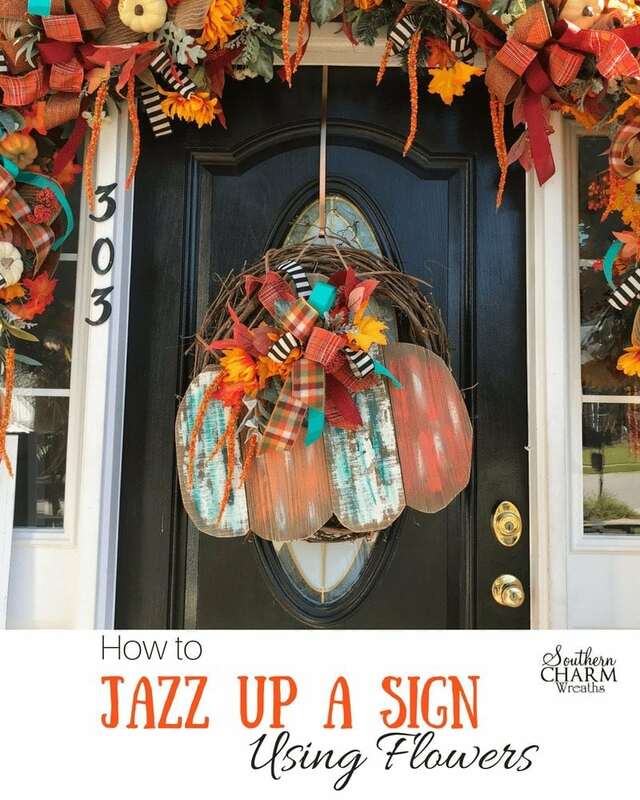 How to Jazz Up a Store Bought Fall Door Hanger Using Flowers! 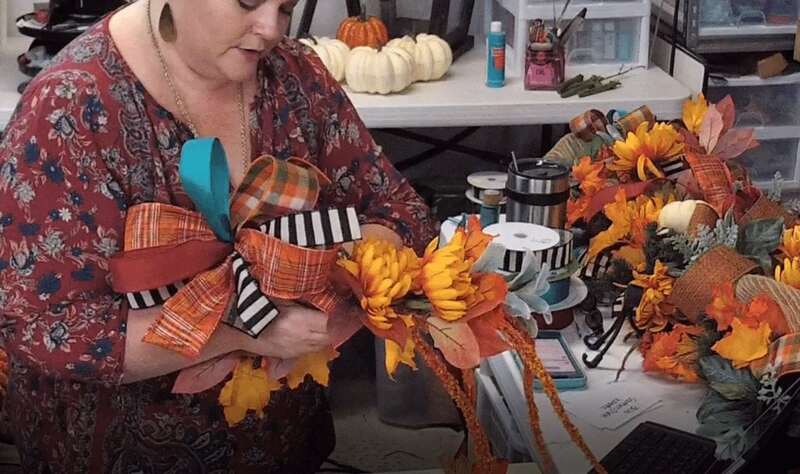 Prep your pumpkin by removing the burlap bow and metal leaf. I also added a bit of turquoise paint so it would better match my décor. Then let it dry. For the bow, I made a funky bow using ribbons that match my garland. I made six 12″ loops. For detailed instructions see video below. Set the bow aside for now. 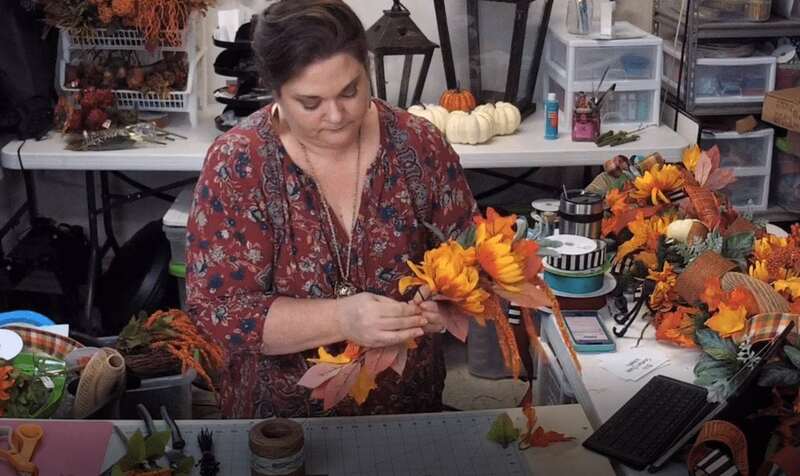 Next, gather your fall silk flowers along with greenery and leaves and make a small bouquet. 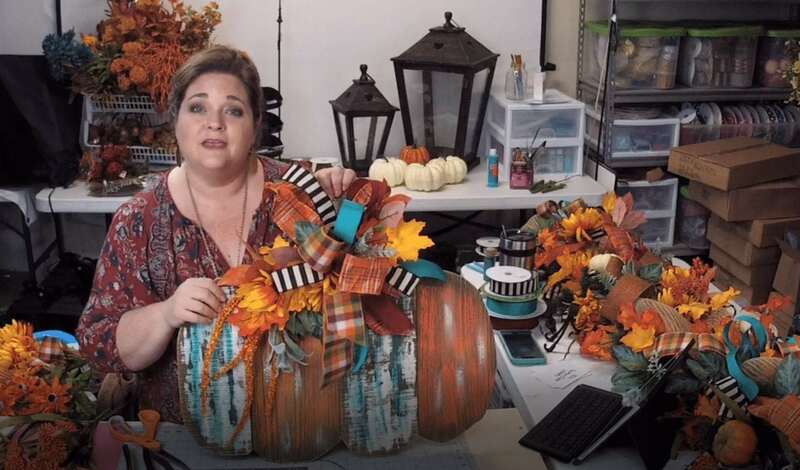 As you are forming your bouquet, hold it up to the pumpkin to gauge the size you need. I added some florals going the opposite direction as well, leaving space between both sides for the bow. Note: Use different textures and lengths in your bouquet. When your bouquet is ready, zip tie it together in a few places making sure it is secure. Cut off any excess zip tie ends. Attach your bow to the empty space in the bouquet where you initially held it together. Note: Hot glue leaves over the zip ties and wire on the back to cover it up. When your sign is dry, attach your bow around the stem using bind wire or floral wire. Arrange your flowers and fluff the bow until you have everything laying the way you would like. For a beautiful finished look, hot glue greenery and flowers into the bow loops. Take time now to also fill in any gaps in the bouquet. Remember not to cover the pumpkin so much that you can’t tell what it is. Stand back and admire your gorgeous work! 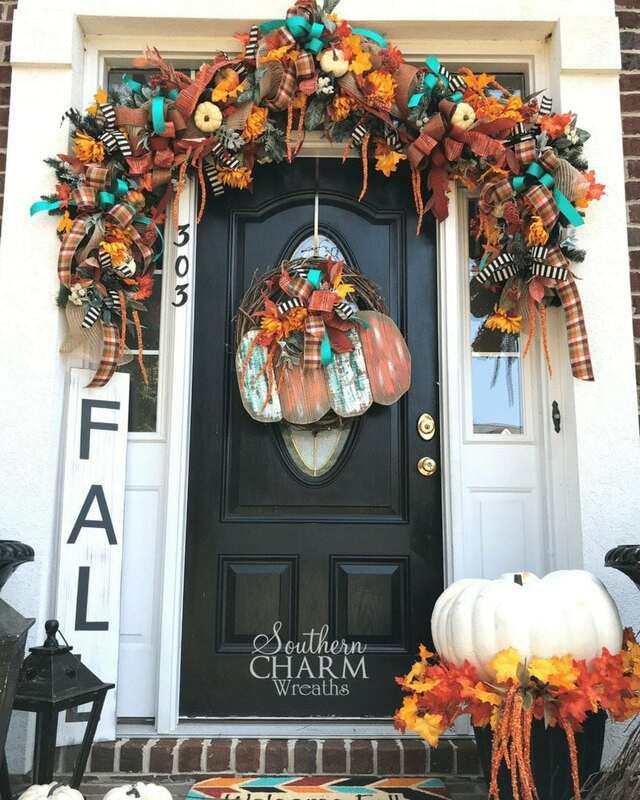 Here’s another great tip for door hanger lovers, when you add door hangers to your door, place them in front of a blank grapevine wreath so that it doesn’t bang against the door every time someone closes the door. I know some who add felt, for scratching purposes, but it still makes a noise when opening and closing the door. The grapevine wreath prevents that. 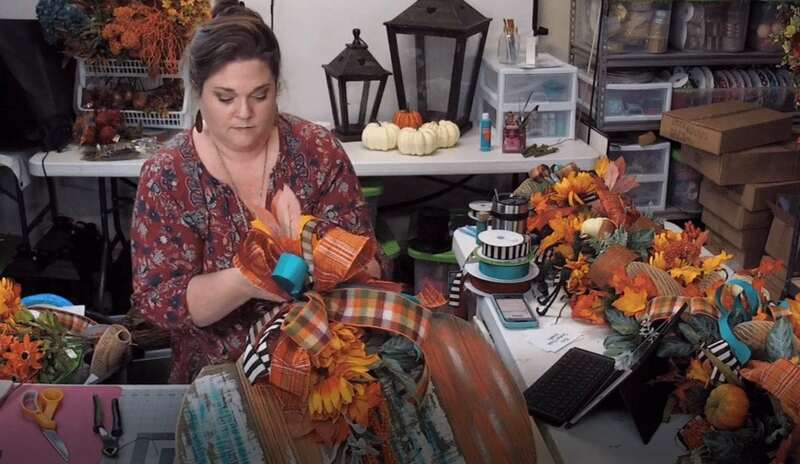 If you would like to learn how to make the fall garland around my door, join our wreath making of the month club where I teach you step-by-step how I made it. Is it starting to get cooler where you are? Sometimes it is hard to get into the fall decorating mood when it is 90 degrees. 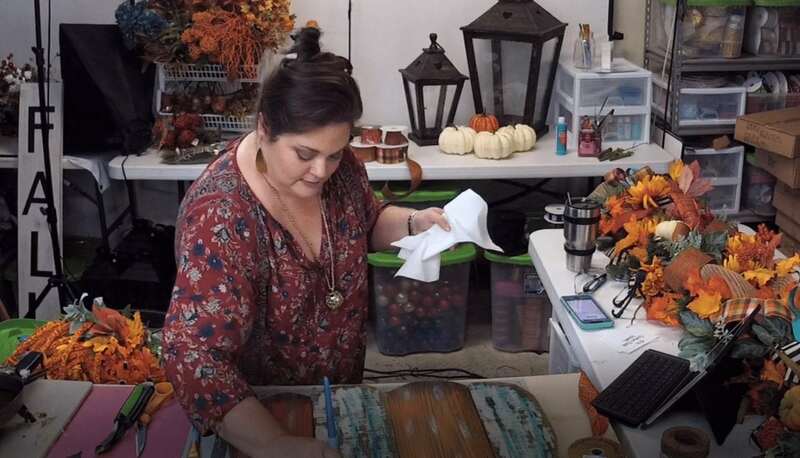 If it is still warm where you are, crank up the air conditioning and pretend while you work on this fun fall project!